Valves are semi-lanceolate to semi-elliptical and strongly dorsiventral. The dorsal margin is smoothly to flatly arched. The ventral margin is straight to slightly concave. The valve ends are protracted, narrowly rostrate to subcapitate, and slightly ventrally deflected. The raphe is positioned close to the ventral margin. The raphe is straight or may have a gradual dorsal bend near the central valve. The proximal raphe ends are weakly inflated with a slight dorsal deflection. The dorsal axial area is narrow narrow, while the ventral side is wider. A dorsal fascia is absent, a ventral fascia is present but difficult to resolve in the light microscope due to the indistinct ventral striae. The dorsal striae are uninterrupted, slightly radiate, becoming more radiate at the poles. 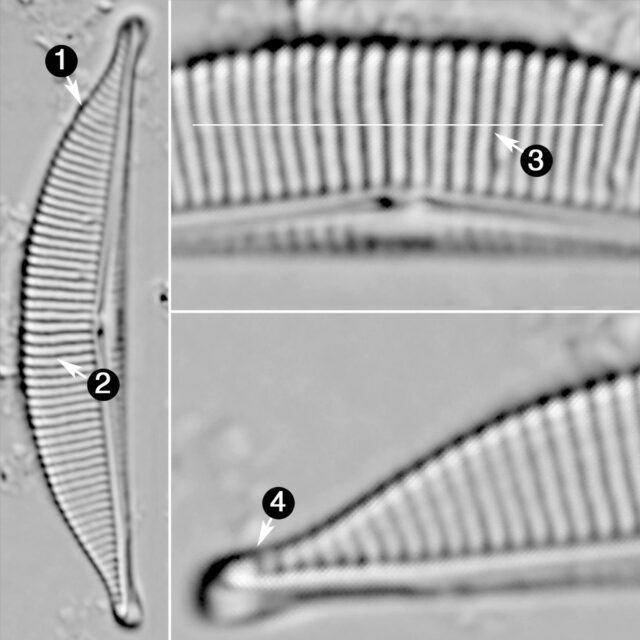 The ventral striae are often difficult to resolve and are radiate near the center, and convergent at the poles. Agardh, C.A. (1827) Aufzählung einiger in den ostereichischen Ländern gefundenen neuen Gattungen und Arten von Algen nebst ihrer Diagnostik und beigefugten Bemerkungen. Flora oder Botanische Zeitung, Regensburg 2:625-640. Valves are strongly dorsi-ventral. The raphe is positioned near the ventral margin. The proximal raphe ends are weakly inflated, with a slight dorsal deflection. A dorsal fascia is absent, and the dorsal striae are uninterrupted. Valve ends are protracted and narrowly rostrate to subcapitate.